ABSTRACT: Analysis of a 630m section of an exploration well penetrating the distal part of the Congo Fan (~2000m water depth) yielded high abundance and diversity assemblages of agglutinated and calcareous benthic foraminifera. 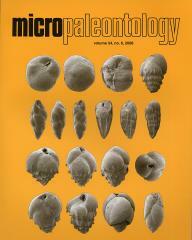 Planktonic foraminifera constrain the age to Early – Middle Miocene, and 18O records reveal the Mi1 (~16.3 Ma) isotopic shift. Relatively few taxonomic studies of deep-water calcareous and agglutinated benthic foraminifera exist from this time period in this locality. All species encountered are therefore taxonomically described and documented using SEM photography (over 170 species), along with 27 species of planktonic foraminifera. Faunas show close affinities to those of the eastern Venezuela Basin, Gulf of Mexico and Central Paratethys. Seven assemblages are defined and analysed using morphogroup analysis and Correspondence Analysis, documenting the response of benthic foraminifera to three primary environmental-forcing factors; energy levels in the benthic boundary layer, oxygen levels relating to changing surface water productivity, and fluctuations in the level of the CCD. Near the top and bottom of the studied section both foraminiferal abundance and diversity decrease, corresponding with increased sand content implying greater energy levels and environmental disturbance. The majority of the section consists of shales with very low percentage sand, high foraminiferal abundance and diversity, and high sedimentation rates of ~10cm/kyr. Morphogroup analysis reveals a major switch in the fauna at around oxygen isotope event Mi1, with the transition from an epifaunal-dominated Cibicidoides assemblage to shallow infaunal-dominated Bulimina assemblage. We regard this as likely due to expansion of the oxygen minimum zone (paleobathymetric estimates are ~1000m) related to increased surface-water productivity and global cooling. Shifts in calcareous foraminiferal percentage over the studied interval overprint these signals and are believed to be related to a shoaling CCD, linked to reduced oceanic acidity and global atmospheric CO2 levels during the early Middle Miocene Monterey Carbon Isotope Excursion.